It’s been over six months since we introduced GitHub for Unity 1.0, and we’ve been busy. Since launch, we’ve continued to improve the extension and fix bugs, focusing on maintenance and providing an overall smoother experience. The GitHub for Unity team received multiple requests to support GitHub Enterprise. Most recently, a team wanted to use the Unity plugin for their gaming engine but needed Enterprise support. GitHub Engineer @stanleygoldman addressed the request and shortly after, we were able to release a beta for customers to use and share feedback on. 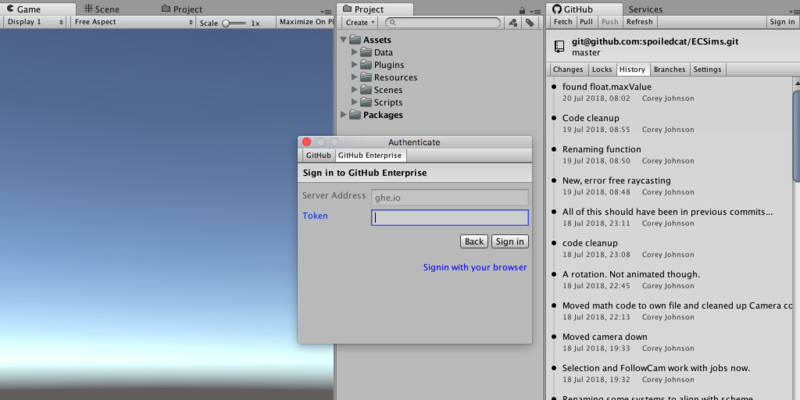 In this release, GitHub for Unity version 1.2.0 officially supports GitHub Enterprise. Now, even more developers will be able to use the GitHub for Unity extension. We’re a small team. We’re still trying to figure out what our impact should be and what work we should focus on. In 2019, we’re excited to see what’s in store for GitHub for Unity—and we’d love to hear your thoughts. If you have questions, feedback, or want to get involved in building the GitHub for Unity extension, reach out to us in the project repository or on Twitter. Or see what we’ve been up to—try GitHub for Unity.